Features and Benefits Bloom Time: B. April Flowering: Blooming Growth Rate: Fast growth rate Plant Group: Shrub Plant Type: Deciduous Plant Zone: Zone 5, Zone 6, Zone 7, Zone 8, Zone 9 Size at Maturity: 6 - 10 F. x intermedia spectabilis 'Lynwood Gold' Forsythia's yellow flowers add a burst of color to the late winter or early spring landscapes. Branches can be picked in midwinter and forced into bloom indoors, making it one of the earliest of cut flowers. The plants when given enough room to grow without pruning, they take on a graceful appearance. They make an excellent informal shrub border, and taller varieties can be espaliered or trained into shapes against a wall. They tolerate poor growing conditions and city life well. 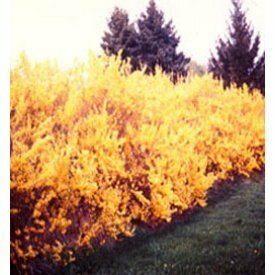 Forsythias thrive in zones 5-9 in almost any type of soil. They do will in full sun or light shade. For hedges, space plants 4 to 6 feet apart, size at shipping vary, shipped bareroot. Thank you for taking a look at our items we will be adding many more new items in the coming weeks. Please keep in mind depending on how you select to have your item shipped it will arrive within 1-10 days.